One of the things that Christians struggle with, is reading the Bible. Some parts of the Bible are really hard to read and some are downright depressing. As we can see from this verse, we are not alone in our struggle. As Ezra read from the Book of the Law of Moses, the Israelites finally understood. They experienced their “A-HA” moment and they celebrated with great joy! Church– Find a church that not only teaches the Bible but encourages a daily living out of the Scriptures. Start attending the Bible studies that are offered or start one of your own with a small group of like minded individuals. Internet– The internet is full of resources on Bible study. There are videos on probably every passage in the Bible, along with online commentaries, Bible study guides, read thru the Bible plans and a variety of other tools to understanding the Bible. I love to look up Biblical maps and guides to the background history of Biblical times to give me a broader understanding of what was going on. Bookstore or Library– Your local bookstore (christian bookstore) or library will have Bible study guides. The benefit of the library is that you can check it out and see if you like a particular book. Prayer– Regardless of what other study tools you use, praying for wisdom and enlightenment is something you need to do EVERY time you read the Bible. A christian giant, George Mueller, never used commentaries or study guides. He said that those guides were one person’s interpretation of the Bible. He simply prayed for wisdom and God opened the eyes of his heart. He only read the Bible and he understood because he prayed. Reading the Bible is one of the most important disciplines of a christian life. When we read the Bible, we get a glimpse into the heart of God. We start to build that relationship with our heavenly Father, as He draws us closer to Him. I am challenging you to choose a Bible reading plan that fits your lifestyle and start reading. Take the time to meditate on what you read and let God’s words sink into your heart. Find a quiet time when you can sit and reflect on what God is saying to YOU through His word. Make this the year that you get to know the heart of God. I guarantee that you will soon be celebrating the joy of understanding. I have started many, through the Bible, reading plans and have failed on many, many occasions. Let’s face it, the Bible is not the easiest book to read. Parts of it can be hard to understand and other parts are downright boring. I can read the same passage a hundred times and get nothing out of it and a few months later, something clicks and I feel like I’m reading it for the first time. Even through the difficulties, I stick with it. Why? Because the Bible is God’s handbook for living. There is wisdom for EVERY situation we could ever face and encouragement for times of trial. God speaks to us through the Bible. I learn life lessons through the imperfect people that God chose as role models for us. Remember the most important reason that we need to study the Bible; it points us to Jesus. The Bible is all about Jesus. As you read, look for Jesus. Studying the Bible works in two ways: 1. Filling our hearts and minds with God’s Word 2. Taking that Word out into the world. Hearing- There are times when I can’t focus on what I’m reading and I will listen to a sermon instead and it really sinks in. The internet is a great source of online sermons on just about any topic or scripture. Many churches will upload their Sunday sermons to their websites, so the general public has access to those during the week. I love to listen to my local christian radio station. Many Hymns and contemporary christian songs are based on scripture and I enjoy the snippets of Bible study and encouragement. I’m sure that we have all watched a T.V. evangelist at one time or another. With Cable T.V., we can now watch sermons, Bible studies, Biblical history shows, christian movies, etc. Going to church is, of course, still the ideal way of hearing God’s Word. Reading- Like I said earlier, I have tried many, read through the Bible, plans. What it boils down to is discipline and sacrifice. I am reading through the Bible in a year now. It isn’t always easy and I tend to have a short attention span, but God is worth it and so I make the sacrifice. The internet is full of Bible reading plans. Go through them and pick the one that works for you. If you really feel that you can’t read through the Bible, word for word, then pick a book of the Bible and pick out the main characters and main events and read about them. Journal about the character, who he/she was, strengths, weaknesses, ways we can learn from this person. Same thing with an event. Write down what the event was, why it was important and what we can learn from this event today. I am a voracious reader, so when I read my devotional or other christian based books, I will sometimes write a blog post on a scripture I have read. This allows me to dig further into that scripture and God’s Word really sinks in that way. I have learned things that I would not have learned otherwise. Journal what you read. If a scripture jumps out at you, write it down. What about that passage spoke to you and how can you use it in your every day life? What has that scripture taught you? Like Verse 2 above says, meditate on the law, day and night. We have to be intentional about letting God’s Word sink into our hearts. Remember that what goes in, will come out. Garbage in, Garbage out. The love of God in, the love of God out. God makes it abundantly clear that we need to put His Words into action. It does us no good, if we can recite the Bible backwards and forwards, but our every day life does not reflect that knowledge. This does not mean that we have to be Biblical scholars. Most of the 12 disciples were not Biblical scholars. They were fishermen, tax collectors and doctors. God just expects us to allow what we know of Him to make an impact on the world around us. I encourage you to look up other scriptures and find out how God expects us to act towards each other. Part of putting action to God’s Words is serving each other. 1 Peter 4:10 tells us that we should use whatever gifts we have received to serve others, as faithful stewards of God’s grace. We are God’s Ambassadors on this earth. God tells us exactly how to treat others and He expects us to obey His Word. *Challenge- find a Bible reading plan and get into God’s Word. Let it seep into your spirit and overflow into the lives of those around you. God says that we will be like a tree planted by streams of water and that we will not wither. That is an amazing promise! So, get in the Word! Ephesians 6:17 tells us that the sword of the spirit is the word of God. 2 But his delight is in the law of the Lord, and on His law he meditates day and night. 3 He is like a tree planted by streams of water, which yields it’s fruit in season and whose leaf does not wither. Whatever he does prospers. At the beginning of Jesus’ ministry, He was led into the wilderness by the Holy Spirit, where He was attacked by Satan. Jesus’ weapon against him was God’s Word – which is the “sword of the Spirit.” We will NEVER be able to win a spiritual battle without our greatest weapon- the Word of God. In order to be victorious in any spiritual battle, we have to know God’s Word. We have to delight in our Bible study time. We have to meditate on the Word day and night. 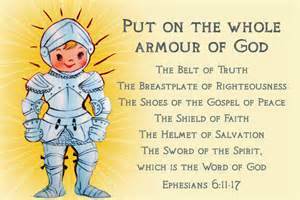 We have to be prepared with the “sword of the spirit,” so we may be victorious in our battle against Satan. 1. Hear God’s Word- We can hear God’s Word at church, on T.V., on the radio, on the internet, and at conferences. We need to keep our ears and hearts open to the voice of God and the whispers of the Holy Spirit. 2. 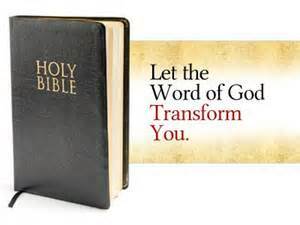 Study The Bible- The main avenue for meditating on God’s Word is putting aside some time each day to study the Bible. You can read through the Bible in a year, pick one book each month to focus on, study a specific topic or a particular person in the Bible. Make your daily study time in bite size increments. The goal is not how fast you can read through the Bible, but how much you learn from the Bible. If you try to take in to much, you will soon be overwhelmed. Even a chapter a day is great, if you are really understanding and can apply what you learn. 3. Pray Scripture- Praying scripture is a wonderful way to allow the Word of God to penetrate the deep recesses of your heart. There are scriptures on every trial or issue we can face and every one of those scriptures can be turned into a prayer. Make it personal and pray God’s Word back to Him. If it comes from your heart, you can not go wrong. 4. Memorize Scripture- This is the hardest one for my 43 year old brain to get a grasp of. One idea that I found on the internet was buying small photo albums ($1.00 at Wal-Mart) and 4×6 index cards…write one scripture that encourages you or has some personal meaning to you on each card, decorate the cards if you want, make them colorful, place the cards in the albums and place in your car, purse, or in several different places. When you are waiting in the school line to pick up the kids, when you are waiting in the doctor’s office or anywhere else, you can take out your albums and memorize God’s Word. Brain-storm to find ways that work best for you. Let me know what you come up with! 5. Begin A Bible Study Journal- Get a composition book, spiral notebook, etc. to take notes in as you study the Bible each day. Write down anything that really speaks to you as you read. Ask the questions who, what, why, where, when, and how to give a better idea of what’s going on in the story. Write down verses that are commands from God that He wants us to obey. Write down ways to apply what you read in your daily lives. Open your heart to the leading of the Holy Spirit. God gives us His Word as a weapon against the attacks of Satan. In order to fight Satan and have any chance of winning, we must arm ourselves with the “sword of the Spirit.” We must meditate on God’s Word and hide the Word in our hearts (Psalms 119:11). I know how hard it is to get into the habit of studying the Bible. I realize that parts of the Bible can be boring. I am not an expert. I struggle with this, as much as the next person. If you need encouragement in this journey, if you want to share what you have read, if you have questions, contact me. I am here to help you in any way I can. I am always willing to research and find an answer for anyone who is seeking to understand the Word. God is waiting for you, my friend!